Did you ever wonder what is the impedance of that piece of unknown coax cable ? Well I did, but the methods of measuring the cable impedance found on the Internet were not satisfactory for me. So I invented a new one. Here's how it works. 1) Take a long piece of cable, usually 3-30 meters, the longer the better. 2) Connect one end of the cable to the cca 10 ns pulser of any frequency. One can use pulser shown in Fig 2. Leave the other end of the cable open. 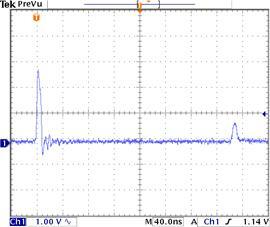 3) Measure a signal at the driving end with a single channel scope. There will be two pulses separated by a time lapse required for the pulse to travel down the cable AND BACK. Measure that time lapse and divide by two to get the time DeltaT (in nanoseconds) that takes the pulse to travel down the cable (see the Fig 1). 4) Measure the capacitance of that particular piece of cable, C (in picofarads). Measuring a cca 2 meter long piece of RG 58 A/U gives me 52.6 Ohm, good enough for such a short cable. 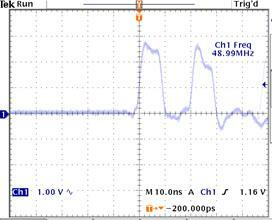 Measurement of cca 29m long piece of RG174C17 50 Ohm cable (see Fig. 3) gave Deltat = 153ns, C=3.10nF => Z=49.4 Ohm. Note that the pulses are separated by 306ns, from which I have calculated DeltaT = 306ns/2 = 153ns. Note also that longer cable will yield a smaller reflected pulse. NOTE 1. This formula might work only for coaxial cables ! where n = refraction index, v = speed of EM waves in the isolator, mu_r = 1 because we do not have magnetic medium.